Jessica Watson-Thorp, Bismillah, 2018. Monoprint on linen. Courtesy of Mestaria and the artist. In Islamic numerology, developed during the Abbasid era, where each letter is assigned a certain number between 1 and 1,000, it is said that the invocation of Bismillah equates to the number 786. This claim is hotly disputed by varying schools of thought across the Islamic world, but 786 has nevertheless evolved to have great significance to many Muslims. This is one of the stories that inspired Jessica Watson-Thorp as she began a personal exploration into the religion and that led her to create the largest piece in her current body of work, which went on display at a Dubai gallery this week. Bismillah is a two-metre-long artwork created on raw linen with French ink. On it are 786 stars in violet, forest green, silver and pewter. The stars are created with hand-cut stencils, overlaid on each other in layers of fine tissue with each one numbered to track her process. It was an extremely labour-intensive technique and the result is a mesmerising constellation. “It is not an exaggeration to say that doing the work and putting my heart into it, as well as many hours of research and practice has broadened my horizons. My work led me to seek more information on the spiritual life of many people living in UAE and as a result, it has made me more tolerant,” says the artist. Jessica Watson-Thorp, Ard I, Landscape - 2018. Monoprints on acid free tissue glazed onto canvas. Courtesy of Mestaria and the artist. Bismillah hangs as part of Tafawut, a group exhibition at Showcase Gallery that places emphasis on Watson-Thorp’s work embracing the Year Of Tolerance. What started off as only a passing interest in the mysticism of Islam, turned into several months of conducting interviews with Muslims across Dubai to produce this series. “The openness and acceptance of everyone I interviewed about this for my research has encouraged me to go deeper and deeper,” she explains. Watson-Thorp is Australian, but has been living and working in the Gulf since 2003, when she moved to Bahrain, later settling in Dubai. Her art has evolved through many ­stages, but since exhibiting in the Sheikh Mohammed Centre for Cultural Understanding (SMCCU) three years ago, she stumbled on the details of Islam and began creating some pieces about her basic architectural studies on mosques. Jessica Watson-Thorp, Athiri - Ethereal, 2018. Monoprints on acid free tissue glazed onto canvas. Courtesy of Mestaria and the artist. For the Showcase exhibition, Watson-Thorp has also created Athiri, a massive two-metre-square swirling image filled with light spaces indicating its ethereal ­nature, and ­Najima, a large and abstract star. 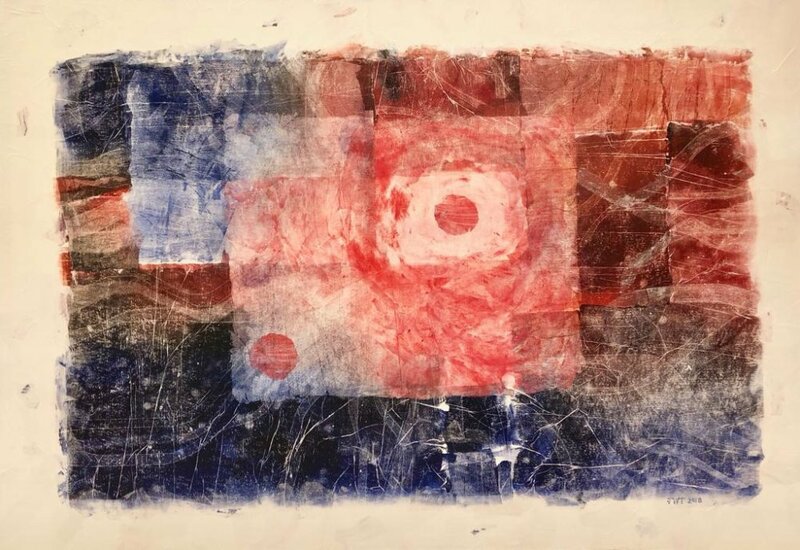 The Ard series, made from reds and blues, is based around the story of Adam as told in the Quran. Also in the exhibition are other works that explore different aspects of Islam. Michelle Harvey’s intricate screen print on paper is based on her photograph of the Sheikh Zayed Grand Mosque in Abu Dhabi, and is a study of the architectural significance of the place of worship. There is also a collective work by the Women of Chitral, a group of female artisans in Chitral, ­Pakistan. It consists of 3,000 hand-­embroidered buttons depicting sets of eyes in the different positions during prayer and was made under the direction of Catherine Braid, an artist who studied textile design at Central Saint Martins in London. 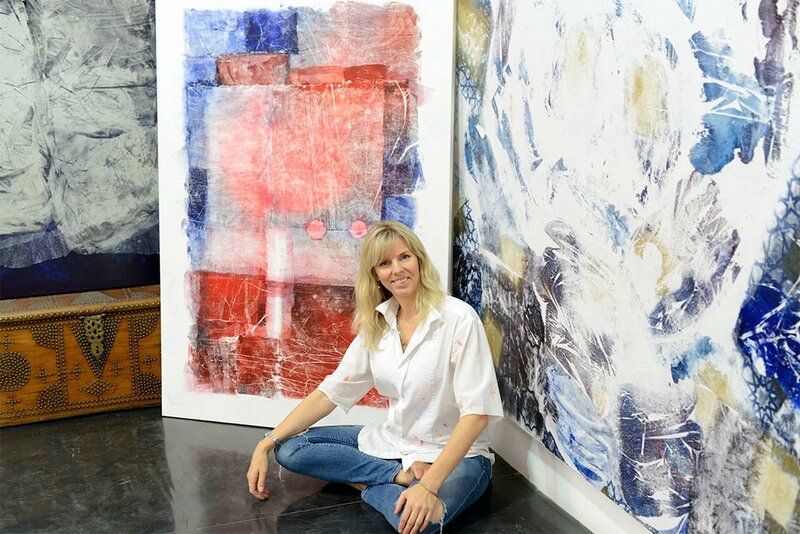 Jessica Watson-Thorp in her studio. Courtesy of the artist. Rounding off the exhibition is Wissam Shawkat’s calligraphic work, which spells out the word “love” in his graphic, stylised font. Shawkat’s lifelong craft in the proportion and malleable properties of his art has allowed him to create striking and contemporary pieces of calligraphy that are still legible. His World Of Love 2 is a circular pattern of classical red lettering, which depicts words of love, which is, after all, perhaps the single most powerful universal message of tolerance across the world.